TC POLYTUNE 3 GUITAR TUNER PEDAL: Whilst retaining popular features of our original PolyTune, such as multiple tuning modes - including polyphonic, chromatic, ultra-precise strobe mode and alternate tunings - we've added one key new feature: a buffer. By incorporating our acclaimed BonaFide Buffer into PolyTune 3, we ensure that your signal - and therefore, your tone - remains pristinely preserved over long cable runs and complex pedal setups. TUNING MADE EASY: How do you want to tune? 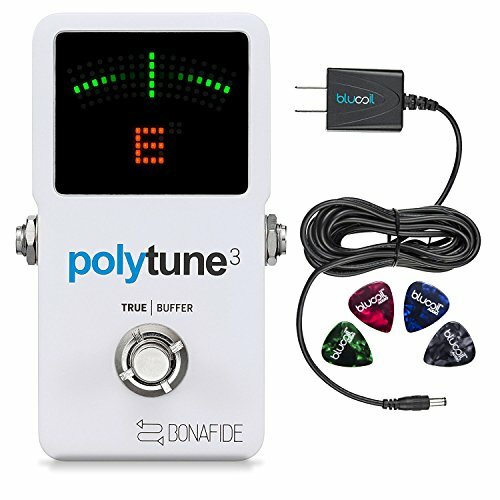 PolyTune 3 lets you switch between true bypass and buffer modes, the latter giving you an "always on" option that keeps the tuner in full operation - even when your signal is not muted. Tuning made simple and more efficient than ever. VERSATILE PRECISION: PolyTune 3 provides high-precision tuning with just a quick strum, whilst the Bonafide Buffer keeps your signal transparent and strong - no matter how many stomps you use, or how long your cable runs. Plus, you'll have the most-versatile polyphonic tuner on the market, right at your toes. BLUCOIL 9V Replacement Power Supply: powers your pedals, ensures that your devices receive the right amount of power, and the UL listed meets UL 5 safety standards.